The Bayshore Homes site is a precolumbian mound and midden complex located in the Parque Narváez neighborhood of Pinellas County, Florida. Over the past decade, archaeological excavation and research have been conducted in a very public environment: the front and back yards of the subdivision’s residents. Involving the residents as partners in the process of discovery about the neighborhood’s ancient past has been an essential component of the project since its inception. This paper discusses the results of such involvement, from the use of volunteers to educating residents about the importance of preserving the neighborhood’s Native American heritage. What is Public Archaeology and Why Should We Do It? It can be argued that all archaeology is public archaeology and that public archaeology therefore has always been with us. The term itself was introduced initially by Charles McGimsey (1972) to refer to (primarily) public funding and support for archaeological research and preservation legislation. Since then the term has come to encompass a much wider array of definitions and goals. Just a brief review of the public archaeology literature reveals the variety of meanings that have come to be attached to the term: sharing of archaeological findings; engaging the public; promoting stewardship; making archaeology relevant; increasing public awareness; archaeology in service to the present; sharing control of resources and knowledge; heritage tourism; the commoditization of the past; and the empowerment of disenfranchised peoples (e.g., Bense, 1990; Colwell-Chanthaphonh and Ferguson, 2008; Hoffman et al., 2002; Layton,1994; Lipe, 2002; Little, 2002, 2009; Moshenska, 2009; Rowan and Baram, 2004; Slick, 2002; see also http://archaeologyincommunity.com/ and http://www.flpublicarchaeology.org/). For me, the simplest definition is the best: public archaeology is archaeology for all (Flatman, 2009:51). By making archaeology accessible to non-archaeologists and allowing the public to participate in a hands-on experience, we break down the barrier of elitism that tends to separate professional archaeologists from the public whose support we covet. By interacting with the public outside of lecture halls, classrooms, and museums, we demythologize the profession and make the past relevant. This paper summarizes an archaeological excavation and research project that I and several of my colleagues have been conducting for over a decade in an environment where interaction with the public is not a choice, but a necessity: the front and back yards of a residential subdivision on the Gulf coast of Florida. Involving the residents as partners in the process of discovery about the neighborhood’s ancient past has been an essential component of the project since its inception, and it has reaped rewards that have benefited the residents as well as archaeologists. The Bayshore Homes site is a large precolumbian (ca. A.D. 250-1250) mound and midden complex located in the Parque Narváez subdivision and an adjacent public park on Boca Ciega Bay in Pinellas County, Florida (Figure 1). Because it is near the intersection of two major roads in one of Florida’s most densely populated counties (Figure 2), the Bayshore Homes site has been in the public eye for over a century. The site was visited by archaeologists in the late nineteenth and early twentieth centuries (Bushnell, 1926; Moore, 1900; Wainright, 1916; Walker, 1880a, b), was well known to early residents (Fuller, 1972:21-22), and was occasionally the subject of outlandish newspaper articles (St. Petersburg Times, August 13, 1914). Its accessibility also made it an easy target for looters, and both Walker and Moore noted evidence of previous digging when they visited the site in 1879 and 1900, respectively. Looting continued right through the 1950s when construction of the subdivision began. Fig. 1: Bayshore Homes archaeological site in Pinellas County, Florida, USA. Fig. 2: Aerial photograph showing the urban character of the Bayshore Homes project in Pinellas County, Florida. This construction was the impetus for the only major professional excavation at Bayshore Homes prior to 1999. A local developer and historian, Walter Fuller, who knew that the site was going to be developed, contacted William Sears at the Florida State Museum and put him in touch with Richard Key, whose company, Bayshore Homes Development, was the origin for the site’s official name. Key gave Sears permission to excavate at the site while development was going on around him (Sears, 1960). Sears dug mostly in the large burial mound, Mound B, where he uncovered over 100 burials, most of which were part of a single mass interment. He also dug a 10-x-10 foot test unit in the large shell midden that borders Boca Ciega Bay. The site also contained a large platform mound (Mound A) and a smaller burial mound (Mound C). Sears did no excavation in these mounds, but he was shown pottery sherds by local collectors who had dug in Mound C, and when Key was clearing the area his bulldozers leveled a portion of the mound exposing burials and more pottery. Mound C continued to be dug into by collectors until eventually the property was completely developed. Sears spent two seasons excavating Mound B. The excavation received a lot of publicity in the local press and visitors to the site were common, particularly as the neighborhood grew up around the mound. Before he started excavating Sears attempted to convince Key to sell the property containing Mound B to the County in order to preserve it (St. Petersburg Times, December 19, 1955; March 30, 1956). Although Key was amenable to the idea, the County chose not to pursue the land purchase (St. Petersburg Times, April 3, 1956). Sears also discussed with Key the possibility of creating a museum with a covered walk-in exhibit so that visitors to the site could view the mound’s contents (Sears to Key, January 6, 1958). This idea also failed to materialize. After Sears’s work was completed in 1958, no professional archaeology took place at Bayshore Homes until 1999. As is often the case in the public’s imagination, most neighborhood residents thought there was nothing left of any importance since the site had been excavated “by the state.” In reality, Sears excavated only a small fraction of the site and although the Parque Narváez subdivision covered much of the archaeological site, large portions remained undisturbed in the yards of the local residents (Figure 3). I and my colleagues began work at the site in 1999 and over the past 11 years we have done an extensive survey of the entire subdivision as well as the neighboring public park. The survey not only expanded the boundaries of the site substantially, it identified a number of intrasite features of which Sears was unaware. We have also conducted test excavations, obtained a dozen radiocarbon dates, and refined the site’s chronology, as well as gathering subsistence and environmental data from the shell midden. The results of this work have been presented at several conferences (e.g., Austin and Mitchem 2008; Austin et al. 2007) as well as in a summary report (Austin et al., 2008) which is available for downloading (http://www.cgcas.org/bayshore/). Here I want to focus on how we involved the Parque Narváez neighborhood in our project, how they have reacted to our work, and how we overcame wariness about our motives and the issue of private property rights. Fig. 3: Wall profile of a test unit excavated in the front yard of a Parque Narváez homeowner showing nearly two meters of intact midden. There are 112 individual home owners in the Parque Narváez subdivision and gaining access to these private properties was essential to our goal of better understanding the site. We were fortunate in this regard because we were able to enlist several local residents to intervene on our behalf. A member of the Central Gulf Coast Archaeological Society (CGCAS), an organization with which I worked closely and which provided much of the volunteer labor for this project, introduced me to the owners of a large shell mound that lies just south of Sears’s midden test. A meeting was arranged and I discussed what I had in mind and reassured them that our work would not destroy their yard. I also assured them that any artifacts that we recovered would be returned to them after we completed our analysis. In Florida there is no law that vests ownership of artifacts with the state if they are recovered from private property; archaeological sites and their contents are the property of the landowner. We felt it was important to gain landowner trust by informing them of their legal right to keep any artifacts from their property. We made this agreement with every homeowner on whose property we excavated. We did suggest that they donate their artifacts to a local museum, the Weedon Island Preserve Cultural and Natural History Center. Most homeowners willingly donated the artifacts; only a few asked to have them returned. In my opinion, it was a fair tradeoff for being allowed to excavate on their property. We also contacted another well known neighborhood resident whose home is situated on an elevated part of the midden and who was responsible for erecting several signs promoting the neighborhood’s prehistory, including one in his front yard. He and the owners of the shell mound signed a letter introducing us to the neighborhood which was hand delivered to all 112 households along with a form that requested permission to dig shovel tests in their yards, indicated whether the land owners wanted to be home when we were excavating, asked for information about where we should not excavate, as well as whether any artifacts we recovered should be returned or donated. Out of 112 landowners, 71 gave their permission; only nine said no, and the rest did not respond. Following our 1999 test excavation, we surveyed the public park in 2001, and the summer of 2006 was spent digging shovel tests in the front and back yards of the 71 residents from whom we received permission. Several residents volunteered to help, which gave us an opportunity to talk to them about the site, what we were trying to accomplish, and build a relationship for any future work we wanted to do. Most of the residents knew about the mounds and the shell midden, and several told us about shell and sometimes artifacts that they had dug up in their yards. We photographed many of these and made notes on all of the information. We also contacted collectors who had dug at the site during the 1950s and documented their artifacts. Based on the results of the survey, we selected four locations for more formal test excavations and received signed permission from all four landowners to proceed (Figure 4). We publicized the project through a newsletter that was distributed to the homeowners. We received favorable press coverage and gave several public presentations, including two meetings held specifically for the Parque Narváez residents. We developed a 14-page summary with plenty of graphics that was geared to the public and was made available on the CGCAS web site. 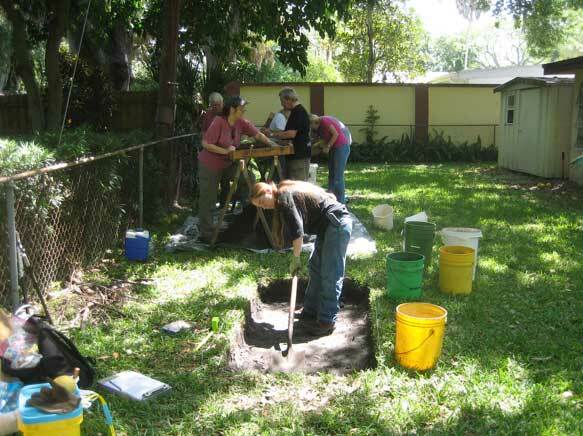 In 2007 we received a grant from the Florida Division of Historical Resources which helped pay for radiocarbon dates and soil coring in the midden. In 2009, we returned to conduct additional test excavations and gather data on the site’s earliest component. In addition to help from local residents, we also had several students on our crew from the University of South Florida and Eckerd College. Currently, we are processing the large volume of artifacts, fauna, and environmental data that we collected during the 2009 season. Fig. 4: Volunteers excavating in the back yard of one of the Parque Narváez homes. A lot of what we have learned about working in a residential neighborhood is just good anthropology. Making contact with respected members of the community is key to getting access to land, people, and collections. So is respecting people’s private property. We used tarps to collect screened sediment, carefully replaced sod, watered the cut sod so it wouldn’t die, and in a few cases, even bought new sod. These small acts did wonders for our reputation in the neighborhood and have made the homeowners comfortable with our presence. We also spend a lot of time communicating our finds to the neighborhood. All of our regular volunteers are capable of conversing in detail about the site, about what we are doing and why, as well as about archaeological methods. The typical question we hear is “Did you find anything interesting?” Which means “did you find any cool artifacts?” I try to keep a stash of cool artifacts (projectile points, worked bone, decorated ceramics) that we have found on hand to show visitors and then use these as a way to lead into a more nuanced discussion of chronology, subsistence, climate and sea level changes, and other topics that we are interested in pursuing with our research. The newsletters, web site, and formal talks are also appreciated by the community. While not everyone attends the talks or accesses the web site, the fact that we make the attempt to inform the community about what we are doing has been well received. The time it takes to chat with visitors or write up a brief description for a newsletter or web site, repays itself many times over when you want access to someone’s yard or when they bring you a curious find that they dug up while planting that rose bush. Because Bayshore Homes is a precolumbian Native American site, the people who live in the neighborhood today have no direct historical relationship to the people who lived there 1000-2000 years ago. Consequently, their relationship to the site is multifaceted. For example, I think that the cooperation and interest in our work displayed by the site’s current residents can be explained partly by the fact that they view the archaeological site as part of their community, providing it with a unique identity. On the other hand, this does not necessarily translate into respectful stewardship, as most residents do not appear to consider the effects of their home maintenance and improvement projects on the archaeological resource. It has also been difficult to convince the County that archaeology needs to be done in advance of improvement projects, despite the fact that the County does have an archaeological preservation ordinance. These contradictory views reflect in microcosm the contradictory attitudes that many Americans have about archaeological sites, particularly those of precolumbian Native Americans. Inherent curiosity is contrasted with a view of archaeological sites as resources to be exploited (e.g., through looting, as “value-added” promotion for development or tourism), and is shot through with a healthy dose of private property rights. Neither is there an archaeologically documented direct historical relationship between the ancient residents of Bayshore Homes and the contemporary, federally recognized tribes in Florida. Because the site is on private property and did not involve disturbance of human burial remains, there are no legal consultation requirements that provide a mechanism for formal connections with tribal governments. Although we continue to encourage participation and involvement from individuals of Native American ancestry, we recognize that formal relationships with tribal governments might not be appropriate or even sought by them. Although I honestly cannot say that our project has changed conflicting attitudes among the residents of Parque Narváez, I do believe that many now have a greater appreciation for what lies beneath their flower beds and manicured lawns. I also believe that involving people in the excitement of doing archaeology, even peripherally, provides an opportunity to indoctrinate; to explain the value (in non-economic terms) of the past, and ignite a spark of understanding and respect for archaeological sites as both information repositories and as tangible expressions of our human past. It is an opportunity that we cannot afford to pass up. 1 The article in question, titled “Race of Giants Once Inhabited the Peninsula,” was but one of several early local newspaper accounts that portrayed Native Americans as “giant” savages. See Harris (1927) for another with a nearly identical title. 2 Historical documents (Cabeza de Vaca, 1993) indicate that Spanish explorer Pánfilo de Narváez probably landed on the Pinellas peninsula near Boca Ciega Bay in 1528, and local developers have eagerly employed the Narváez name to promote their building efforts. In the 1920s, developer Walter Fuller erected a large sign commemorating Narváez’s landing that still stands near a large mound about 1.5 km south of the Parque Narváez subdivision. Fuller used the sign to promote his many housing developments in this part of the County. On the other side of the Pinellas peninsula, E. M. Elliot’s proposed development on Weedon Island was called Narváez Park for the same reason. Elliott also claimed Hernando de Soto stopped there and was not averse to promoting the Smithsonian Institution’s 1923 excavations at the famous Weedon Island archaeological site to entice visits by tourists and prospective investors (E. M. Elliott and Associates, c. 1923). 3 Florida’s two federally recognized tribes are the Seminole Indian Tribe of Florida and the Miccosukee Tribe of Indians of Florida. Both tribes are active in asserting their rights and concerns regarding archaeological sites that they consider part of their native heritage (e.g., Cypress, 1997; Cypress et al., 2002; Dayhoff and Terry, 2002). The tribes, in concert with the Florida Governor’s Council on Indian Affairs, were instrumental in amending Chapter 872 of the Florida Statutes (Offenses Concerning Dead Bodies and Graves) to make it a felony to “willfully and knowingly” damage or destroy Native American cemeteries and burial mounds (Quetone, 1987; Tesar, 1987). Unlike the federal Native American Graves Protection and Repatriation Act (NAGPRA), which applies only to federal and tribal lands, the Florida law extends protection to archaeological sites that contain human remains on private land. The Bayshore Homes project has been funded in part by Historic Preservation Survey and Planning Grant SO819 provided by the Florida Department of State, Division of Historical Resources. Additional funds were provided by the IBM Corporation and an anonymous donor. Brent Weisman, Uzi Baram, and an anonymous reviewer provided comments on earlier drafts of this paper that substantially improved the final product. I would like to thank the Central Gulf Coast Archaeological Society for the many hours of volunteer labor they have contributed to the project; the Weedon Island Preserve Cultural and Natural History Center for providing laboratory space; and last, but certainly not least, the residents of Parque Narváez for their cooperation and interest. Austin, R J, and J M Mitchem 2008 Site Formation and Chronology at Bayshore Homes: A Late Weeden Island Mound Complex on the Gulf Coast of Florida. Paper presented at the 65th annual meeting of the Southeastern Archaeological Conference, Charlotte, NC. Austin, R J, J M Mitchem, and A Fradkin 2007 Recent Research at Bayshore Homes (8PI41), St. Petersburg, Florida. Paper presented at the 71st annual meeting of the Florida Academy of Sciences, St. Petersburg, FL. Austin, R J, J M Mitchem, A Fradkin, J E Foss, S Drwiega, and L Allred 2008 Bayshore Homes Archaeological Survey and National Register Evaluation. Report prepared for the Bureau of Historic Preservation, Florida Department of State. On file, Florida Division of Historical Resources, Tallahassee, FL. Bense, J A 1990 The Search for the Lost Rectors: A Public Archaeology Project – Overview and Project Description. The Florida Anthropologist 43(2):127-130. Bushnell, D I, Jr. 1926 Investigations of Shell and Sand Mounds on Pinellas Peninsula. Smithsonian Miscellaneous Collection 78:125-132. Cabeza de Vaca, Á N 1993 The Account: Álvar Núñez Cabeza de Vaca’s Relación. An annotated translation by Martin A. Favata and José B. Fernández. Houston, TX: Arte Público Press. Colwell-Chanthaphonh, C, and T J Ferguson 2008 Collaboration in Archaeological Practice: Engaging Descendent Communities. Walnut Creek: Alta Mira Press. Cypress, B L 1997 The Role of Archaeology in the Seminole Tribe of Florida. In Native Americans and Archaeologists: Stepping Stones to Common Ground, edited by Nina Swindler, Kurt E. Dongoske, Roger Anyon, and Alan S. Downer, pp. 156-160. Walnut Creek, CA: Alta Mira Press. Cypress, B, T Underwood, and E Doonkeen 2002 Native American Views on Significance. In Thinking about Significance, edited by Robert J. Austin, Kathleen S. Hoffman, and George R. Ballo, pp. 113-119. Riverview, FL: Florida Archaeological Council, Inc.
Dayhoff, F E and W S Terry 2002 Miccosukee Tribal Beliefs Concerning Archaeological Significance. In Thinking about Significance, edited by Robert J. Austin, Kathleen S. Hoffman, and George R. Ballo, pp. 105-112. Riverview, FL: Florida Archaeological Council, Inc.
E M Elliott and Associates c. 1923 Tourists! You are Invited to Visit the Smithsonian Excavations. Copy of promotional flyer on file, Weedon Island Preserve Cultural and Natural History Center, St. Petersburg, FL. Flatman, J 2009 The Economics of Public Archaeology – A Reply to “What is Public Archaeology?” Present Pasts 1:50-52, doi:10.5334/pp.9. Fuller, W P 1972 St. Petersburg and Its People. St. Petersburg, FL: Great Outdoors Publishing. Harris, T 1927 Giant Savages Once Inhabited This Peninsula. St. Petersburg Times, Pinellas County Section, p. 1, September 25, 1927. Hoffman, K S, G R Ballo and R J Austin 2002 The Past in Service to the Present: Some Concluding Thoughts. In Thinking about Significance, edited by Robert J. Austin, Kathleen S. Hoffman, and George R. Ballo, pp. 215-225. Riverview, FL: Florida Archaeological Council, Inc.
Layton, R 1994 Introduction: Who Needs the Past? In Who Needs the Past? Indigenous Values and Archaeology, edited by Robert Layton, pp. 1-20. London and New York: Routledge. Lipe, W D 2002 Public Benefits of Archaeological Research. In Public Benefits of Archaeology, edited by Barbara J. Little, pp. 20-28. Gainesville, FL: University Press of Florida. Little, B J 2002 Archaeology as a Shared Vision. In Public Benefits of Archaeology, edited by Barbara J. Little, pp. 1-19. Gainesville, FL: University Press of Florida. Little, B J 2009 What Can Archaeology Do for Justice, Peace, Community and the Earth? Historical Archaeology 43(4): 115-119. McGimsey, C R III 1972 Public Archeology. New York, Seminar Press. Moore, C B 1900 Certain Antiquities of the Florida West Coast. Philadelphia Academy of Natural Sciences Journal 11:349-394. Moshenska, G 2009. What is Public Archaeology? Present Pasts 1:46-48, doi:10.5334/pp.7. Quetone, J A 1987. Chapter 872, Florida Statutes (“Offenses Concerning Dead Bodies and Graves”): A Native American’s Perspective. The Florida Anthropologist 40(4):328-329. St. Petersburg Times 1914 Race of Giants Once Inhabited this Peninsula. August 13, 1914. St. Petersburg Times 1955 Indian Mound May be Historical Park, Museum. December 19, 1955. St. Petersburg Times 1956 Indian Site Wanted for Park Area. March 30, 1956. St. Petersburg Times 1956 Indian Mound Proposal Draws Cold Shoulder. April 3, 1956. Sears, W H 1958 Letter from William Sears to Richard Key, January 6, 1958. Papers of William H. Sears, Bayshore Homes, 8PI0041. Collections of the Anthropology Division of the Florida Museum of Natural History, Gainesville, FL. Sears, W H 1960 The Bayshore Homes Site, St. Petersburg, Florida. Contributions of the Florida State Museum, Social Sciences Number 6, Gainesville, FL. Slick, K 2002 Archaeology and the Tourism Train. In Public Benefits of Archaeology, edited by Barbara J. Little, pp. 219-227. Gainesville, FL: University Press of Florida. Tesar, L D 1987 Chapter 872, Florida Statutes (“Offenses Concerning Dead Bodies and Graves”) Amended: the Law and Its Significance. The Florida Anthropologist 40(3):221-223. Wainright, R D 1916 Two Months Research in the Sand and Shell Mounds of Florida. Archaeological Bulletin 7:139-144. Walker, S T 1880a Preliminary Explorations among the Indian Mounds in Southern Florida. Smithsonian Institution Annual Report 1879:392-413. Walker, S T 1880b Report on the Shell Heaps of Tampa Bay, Florida. Smithsonian Institution Annual Report 1879:413-422.